SmartLooks offers an exceptional collection of Hunter Douglas horizontal window blinds in a variety of styles, colors, and materials. 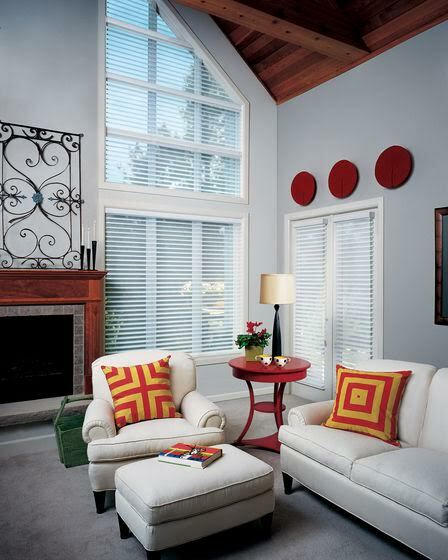 Here at SmartLooks you will find the perfect blinds to match your interior design and décor. Our horizontal blinds are especially suited for smaller windows, as they create an illusion of larger windows in small rooms and spaces. Not only can they achieve that aesthetically pleasing look every room should have, but will trick the eye into seeing a larger window space. Choose from our elite selection to achieve the perfect window treatment for your home! From a textured faux wood blind, aluminum, or basswood blind, SmartLooks has exactly what your home needs. – Parkland wood cornices are a great addition over any window treatment, especially draperies. With detailed hand craftsmanship in 100% domestic wood, in a selection of styles, heights and decorative options. For more information about our Parkland wood cornices contact your local window treatment specialist. – This smart alternative to wood blinds has classic good looks that don’t age. Available in realistic TruGrain® finishes or a large selection of solid colors, and with operating and decorative upgrades available. They’re guaranteed against fading, yellowing, warping or bowing—which makes them perfect for the humidity of your bathroom or rooms with full sun. – For twice the view through, aluminum blinds with our patented MagnaView® feature combine exclusive tilt operation with traditional Hunter Douglas quality. Tilted closed, it looks like a traditional blind; tilted open, it reveals twice the view of an ordinary horizontal blind, at the same time increasing incoming light. – Clean, crisp and modern, Skyline® Gliding Window Panels offer a sleek answer for both large and small window expanses. Open, they stack tightly to offer the maximum view; closed, they display their rich fabrics and texture. Available in over 600 roller and screen-style fabrics, these window panels also coordinate seamlessly with our Designer Roller and Screen Shades. – Our Cadence® Soft Vertical Blinds feature curved vanes, mimicking soft drapery folds that offer exceptional sound absorption, elegant styling and translucency. Our patented headrail design reduces light gaps and allows smooth, trouble-free operation. – Easy, precise light control. Everything from sliding glass doors to bay windows look prettier with our Somner® Custom Vertical Blinds, which feature easy operation and superior light control. Available in a wide range of vinyl, fabric and aluminum styles and an impressive array of colors, textures and patterns. – Our Vertical Solutions® Vertical Blinds are an economical assortment of verticals offered in 3 ½” styles, patterns and colors. Available in fabric and vinyl.